I recently started bullet journaling. For those that don't know it is essentially using a notebook or journal as your own custom planner. One of the components that some people use is a "year at a glance" page. After creating my page I realized that it was a complete waste of time to have this page. I didn't know where I would be in the next three months let alone the next year. "The only constant in life is change," is a quote I believe perfectly applies to military life. You think you're moving somewhere, then you aren't. You think you'll be able to find your perfect job easily at your new post, but it takes longer than expected. We have this idea in our minds on how we would like things to go but sometimes they simply don't. This doesn't always have to be a negative thing and can sometimes even be for the better. 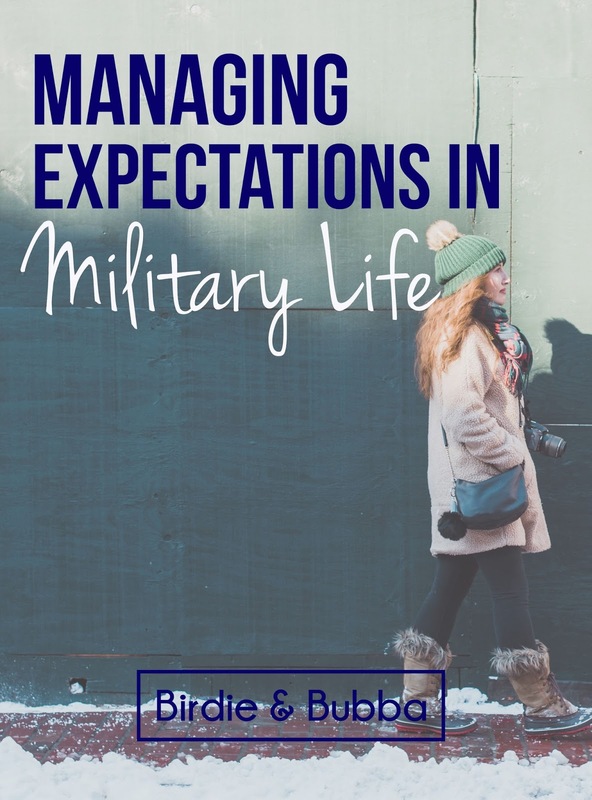 Managing the expectations we have for our experience with military life is essential to making sure we make this experience worthwhile. It is impossible to know what the future will hold in military life or not. We can go months or even years with minimal bumps in the road, only to have a sudden deployment date that changes five times. I used to think that the best expectations were to have none at all. But, it made me feel lke I was just kind of floating through life....and I was bored. I can't live my life expecting things to always change at a moments notice. Changes will come and they can sometimes come more frequently than normal, but we cannot lose track of what is important like our relationships, goals and passions. You don't have to be "fine" with every new or unexpected thing that will happen in your life. I have made the mistake of burying my emotions a million times over and it did nothing but make me even more miserable. You can be angry, you can cry, and you can "angry cry". It is not shameful to not react positively to every change that comes your way. I recently started to attend a bible study where I would say at least 65% of the women are spouses of career military veterans. They have been through events in their life that most of us cannot imagine. They are a wealth of knowledge when it comes to military relationships and can provide a perspective most of us do not have. If you aren't in a bible study like I am, I would recommend taking a look at some facebook groups that are geared toward military spouses. 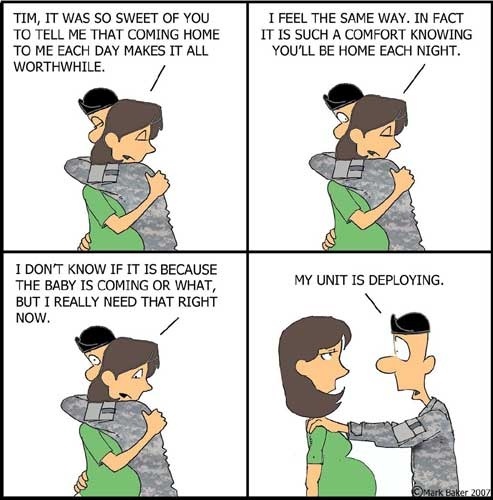 There are also a plethora of blogs run by spouses of military members who have been in for 10+ years. There are so many great resources out there that can help with navigating what comes next in military life. Just because plans and timelines change does not mean that you need to stop everything you are doing. You may have to switch focus in the short term, but I encourage you to not just give up on what you love or want to achieve. 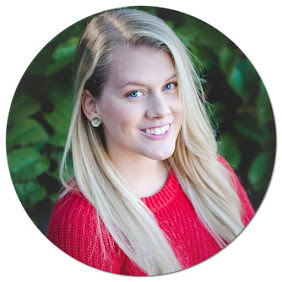 My goal was to make this blog a great resource for military spouses like myself who knew nothing about military life. If I gave up the multiple times I wanted to, I would probably be going crazy right now! Also when things go sideways, having something to focus on has helped me tremendously when things feel like they are out of my control. Interesting! Your frank views on military life should be a must-read for any military spouse. Such a great article! I'm the wife of an Army Veteran. What a difficult lifestyle. It is great that you make it work. I think being honest about your feelings in the face of someone else being in control of the moves and changes must be the only way to survive. It's important to be flexible in life as everything can change or even run counter to our expectations. The only predictable thing in life is that life is unpredictable, right? Yet I still think a long-term goal is necessary so that we know where we are heading for.